Supplement Tree Hyaluronic Acid 100mg capsules provide an optimum dose of this natural substance to reap maximum benefits. Hyaluronic Acid 100mg capsules are of high premium grade standard that contain 42-50% naturally occurring Glucoronic Acid and are 100% Free from GMO’s (Genetically Modified Organisms). 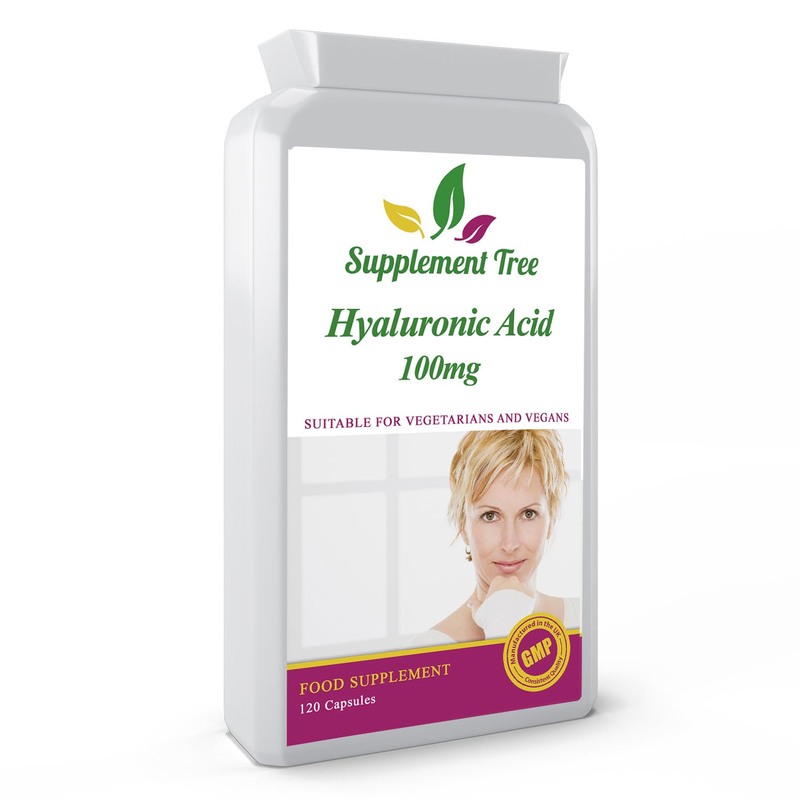 Supplement Tree Hyaluronic Acid 100mg capsules provide an optimum dose of this natural substance to reap maximum benefits. Hyaluronic Acid 100mg capsules are of high premium grade standard that contain 42-50% naturally occurring Glucoronic Acid and are 100% Free from GMO’s (Genetically Modified Organisms). Hyaluronic acid (HA) is glycosaminoglycan (carbohydrate molecule), which is present in all connective tissues responsible for retaining moisture. 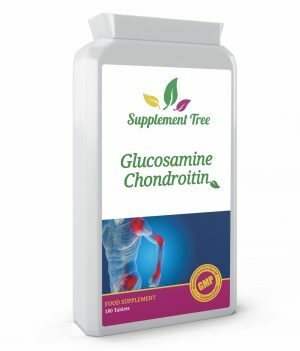 Studies show that supplementing with HA has shown multiple benefits from improving skin moisture content and elasticity, assists in moisturising the eye, as well as providing lubrication to the connective tissues and supporting healthy joints. As we age, the level of hyaluronic acid in our bodies can drop as much as fifty percent. 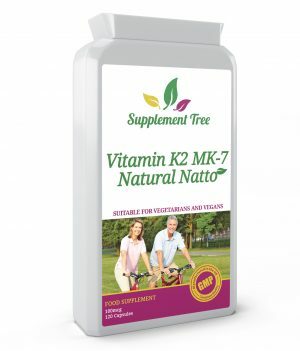 Genetics, smoking and deficiencies such as magnesium and zinc can all play a part to accelerate this loss, but levels of hyaluronic acid drop in all of us to some degree naturally. As these levels drop we may find ourselves with aching joints or dry skin. Supplementing with hyaluronic acid can help promote healthy joints and skin. 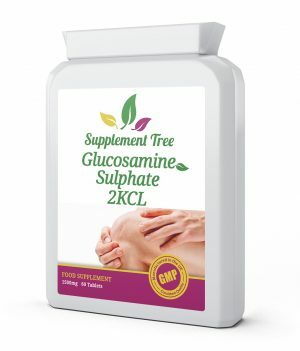 Supplement Tree Hyaluronic Acid 100mg Capsules are Manufactured in the UK to GMP code of Practice and in ISO:9001 Quality Assurance Certification. Supports healthier looking skin and helps keeps it moisturised. 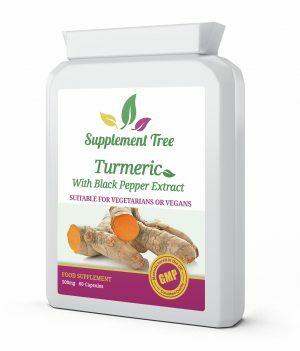 Helps transport nutrients into the eye. Take 1 capsule daily, preferably with meal. Not Suitable for anyone looking to remove Soybean & Starch from their diet. This product is manufactured in a facility that also handles allergy based materials such as nuts, seeds, milk, egg, cereals, mustard, celery, fish, crustaceans and sulphites.